"Postal-fiscals" are tax (revenue) stamps that have been officially made valid for use on mail. At the left are examples of Bhutan's first tax stamps from 1954 marked the way they are normally cancelled in Bhutan when used as receipts for taxes. The taxpayer either initials or provides a fingerprint. Fiscal stamps that were used to pay postage in Bhutan were "postmarked" by governing officials in the monastary-fortresses (Dzongs) from where runners were periodically dispatched. The canceling device used was usually the official's seal of office. The set at the right has been favor "cancelled" with the mark of the Secretary to the King of Bhutan. the "Dzong Dak" mail system, records of existing covers, etc., see the Postal History link in the menu.. I can usually offer mint sets (if there's a price at the left, then they are in stock). Cancelled copies (whether fiscal or postal) are not usually available and copies on cover are rare. The blue value is the scarcest (mostly used for postage). The set has been reprinted over the years on paper that varies slightly from the original printing. Feel free to inquire about availability of specialty items..
For new-era fiscals, see the fiscals page in the menu. world. The groundwork was laid at this time for the eventual demise of the Dzong Dak mail system. Sometime in late 1961 or in 1962, the blue value postal-fiscal was surcharged with two different values (10 NP and 25 NP) and placed on sale, most likely in the office of the Bhutanese Sub-Divisional Officer (SDO) in the Bhutanese border town of Phuntsholing (the gateway to Bhutan from India). It has been said that the purpose was to provide an equivalent value in Indian decimal currency to the Bhutanese values expressed with the Tibetan numerals "1", "2", "4" and "8" in the lower corners of the stamps..
First, the 10 NP on the blue "1" stamp doesn't equal the face value the stamp sold for in Bhutan (25NP) and, second, until October 10, 1962, there was only the internal Dzong Dak mail system available that served only places in Bhutan and the Indian towns around Kalimpong, India (to the west of Bhutan, south of Sikkim); that was the limit of the area in India where Bhutan government runners were permitted to go on official duty. 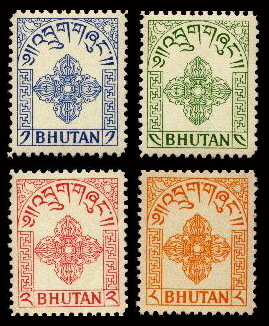 After October 10th, regular Bhutan P&T stamps became available for use on mail to all places in India and Sikkim (and around the world under the sponsorship of the India Post). The postal-fiscals remained valid and were usable on either the Dzong Dak or the new P&T system. This occurred, because much of the P&T mail was turned over to Dak runners in the "early days". That the surcharged values are genuine is not doubted. The reasons and substantiation are on a page in the Postal History section. These stamps are very scarce in unused condition (at most 4 or 5 copies known in the west) and they are very rare on contemporary non-philatelic covers (2 recorded - illustrations in Postal History). Three or four philatelically inspired covers exist that have been recorded, and it is likely that a few others may surface in the future. 25 NP surcharged on 25 Shiki ("1") blue value. (For an explanation of "shiki", see Postal History). 10 NP surcharged on 25 Shiki ("1") blue value.